I’ve no compunctions in admitting that my ignorance of contemporary writers is monumental. I had not heard Yasmin Alibhai-Brown or her masterpiece of a book. 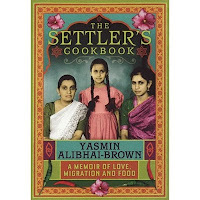 The Settler’s Cookbook – A Memoir of Love, Migration & Food that was published last year to wide acclaim in Britain. House of Anansi Press Inc., the distributors of Portobello books in Canada, has brought the paperback edition of this genre-bending memoir and a cookbook rolled into one. Thanks to my friend Yoko Morgenstern, I’m reading it right now. Quite simply, it’s an amazing book. I haven’t finished reading it yet so it would be improper to review it. I'm sure nobody would mind if I comment on it. You can also read it as a recipe book. Although that wouldn’t be half as interesting as reading the book as it’s written – memoir interspersed with recipes. Yasmin weaves the recipes into the story of her life. She does this assuredly and with dexterity. When you begin to read the recipe, you can’t help but reminisce about your own past. A past that in my case is now a swiftly fading memory. Any Gujarati would feel the same way. Reading these recipes transported me back into time and place when (in a world that somehow felt more secure than now), my mother and my Ba cooked for us – my sister and I – adding dollops of affection to their considerable culinary skills. They could make everyday home food taste better than restaurant food. Yasmin’s book has several finger-licking non-vegetarian recipes. I've only listed the vegetarian dishes because of my largely vegetarian upbringing. It’s been a while since I’ve had traditional Gujarati food. Let me hasten to add here, that to Mahrukh’s credit, despite being a non-Gujarati and a Muslim, her urad dal is as good as my Ba’s. Yasmin’s memoirs are important in the context of Diaspora writing because the stories are about real people and about their despair at being uprooted from a land that they never quite considered home and yet didn’t know of any other place they could call so. The story of Yasmin’s family is as compelling as Salim’s story in Naipaul’s A Bend in the River. There is a sizeable Gujarati speaking population in Canada of first generation immigrants from East Africa (including the Ismailis, Yasmin’s community) who will identify with many situations that Yasmin describes in her book. In fact, all Gujaratis will enjoy the book. 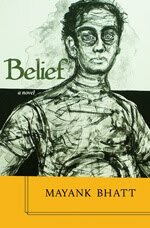 However, that would be an unfair summation of the book’s appeal. The book effortlessly transcends geographical boundaries and ethnic classifications. Moreover, The Settler’s Cookbook portrays seemingly commonplace situations in a devastatingly deadpan style.